Khorsassan, which means the land of the rising sun in Farsi, is the largest of Iran’s provinces. The names Khorassan or Mashad are used interchangeably with the latter meaning a finer woven, shorter clipped Khorassan. Second to Isfahan, Mashad is often described as the most beautiful city in Persia and as a religious shrine; it is also considered the most important. The town is rich in agriculture and one of the best wool producing regions in the Persian Rug world. Located in the northeastern province of Khorasan in Iran, Mashad is a prominent center of the carpet weaving industry and has been a major producer of Persian rugs for centuries. The holy city of Mashad is situated in the east of Iran, in the enormous province of Khorasan. Mashad is the holiest city in Iran, the eighth imam died and is buried, here in the year 817. This place has grown from an insignificant village to one of the countries largest cities with a population of 2 million inhabitants. More than 12 million Shiah Muslims visit the city every year. The city of Mashad is renowned for producing some of the best wool in Iran, and the rugs that come out of this region are of very high quality. Mashad rugs are easily identifiable design due to their pronounced traits. In turn, their designs have made them a highly sought after item. Mashad Rugs are generally large in size although you can find them in various sizes and designs. Mashad rugs have a special approach in terms of their materials. While many rugs on the market are made with either cotton or wool, Mashad rugs are crafted with both. The Mashad are weaved with a cotton foundation, followed by a wool pile. This action gives the rug a distinctive texture–one that is soft and cozy, yet sturdy and durable. The wool used is soft, and the pile is tight and thin. 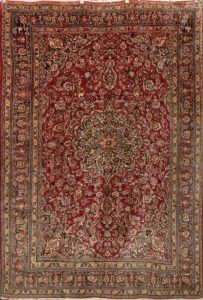 Dark red, blue and khaki are the typical colors used in the carpets making up a curvilinear pattern with a single central medallion, the corners generally illustrate floral designs, and floral motifs occupy the background. Many of the best carpets in the world are made in Iran, and many of the best carpets in Iran are made in Mashad (in the Saber workshop) giving an idea of how important Mashad is as a carpet-weaving center. Knot counts normally range anywhere between 120-475 KPSI, the higher the knot count, normally the higher the quality. All the design elements in a Mashad Rugs are mostly curvilinear. There is usually a single, large central medallion with a very detailed background filled with curvilinear floral motifs and floral designs in the corners. The central medallion is called the Shah Abbasi medallion. Mashad rugs have several design elements that are common with Kashan rugs, with only very small differences between them. 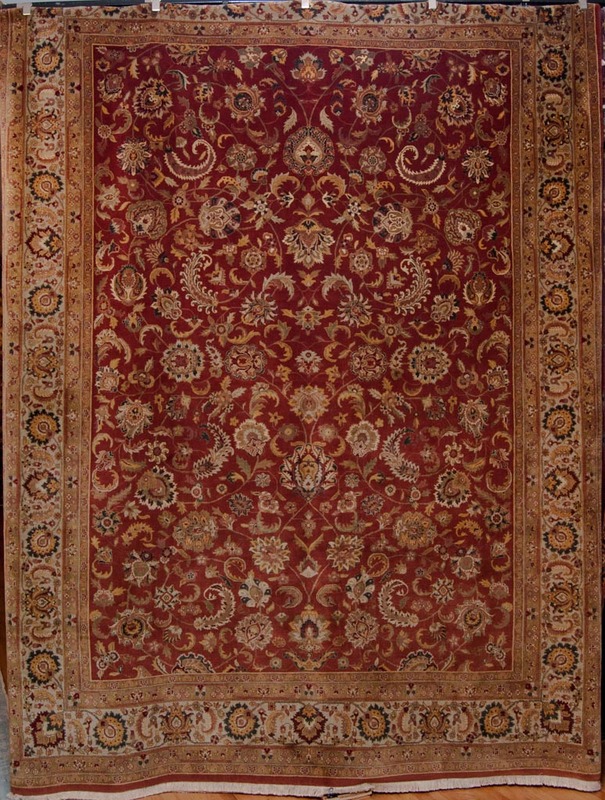 However, Mashad rugs have one unique feature that helps distinguish between the two, and that is their elongated corners. 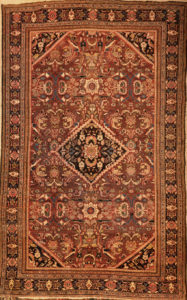 In the Mashad rug layout, the corners are so elongated that they sometimes touch or almost touch near the center of each border on each side of the rug. Other motifs that the Mashad weavers use in addition to the Shah Abbasi motif are Boteh and Herati motifs. 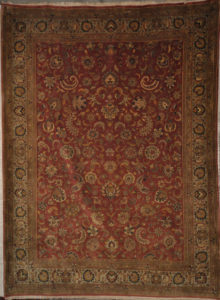 Unlike the single, large, central Shah Abbasi motif, Botehs and Heratis are smaller and woven in a repeated, all-over pattern. The colors are non-varying, and most use exclusively red and blue as the dominating colors with ivory or khaki used to provide an interesting contrast. The background is typically deep, dark red with dark blue highlights found in the center medallion, corner pendants, and border. 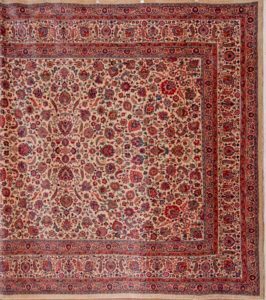 The red background is a distinguishing characteristic of Mashad rugs. With their high quality, soft wool, bold colors and stunning design elements, Mashad rugs are in high demand all over the world. 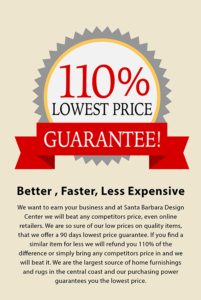 Moreover, the construction techniques that are used to create these rugs make them sturdier and longer lasting, which are qualities most people look for when they are investing money in a rug. Demand for Mashad Rugs has risen over the years as people have come to appreciate their gentle wool, thorough designs, and winding colors. Sturdy, one of a kind, and genuine in their craft, the Mashad is another fine selection among the many Persian rugs on the market. Come and stop by our gallery to find Fine Antique Mashad Rugs at 410 Olive. 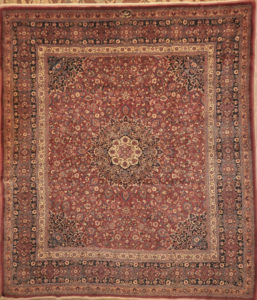 Antique Persian Mahal made of natural dyes and woven with natural wool. Designed with diamond medallion in the center. Mashad rugs come to us from the Persian city of Mashad, one of the holiest cities on Earth and home to some of the most desirable rugs, with extensive workshops dating back more than a thousand years. Of these workshops, there are none better than the Royal Workshop of Master Saber, who was the master weaver of the Royal Family of the Shah. This spectacular antique Mashad rug bears the Saber signature, and is truly a work of art. This rug must be seen to truly appreciate it, as the meticulous craftsmanship is unrivaled and cannot be captured by one photo. A Mashad from East Persia.